Greenville point guard Morgan Gilbert gets the ball across the half-court line during first half action of a non-league game against Bethel on Monday. The Lady Wave celebrated Senior Night with a 49-38 win over the Bees. Greenville’s Haleigh Mayo-Behnken splits a pair of Bethel defenders on her way to the basket during a non-league game on Monday. The Lady Wave celebrated Senior Night with a 49-38 win over the Bees. Greenville senior Jada Garland connects on one of her three 3-pointers in a non-league game against Bethel on Monday. The Lady Wave celebrated Senior Night with a 49-38 win over the Bees. Greenville senior Koryann Elliott gets fouled trying to score during first half action of a non-league game against Bethel on Monday. The Lady Wave celebrated Senior Night with a 49-38 win over the Bees. Greenville’s Natea Davidson tries to finish at the basket after stealing the ball and driving the full length of the court during a non-league game against Bethel on Monday. The Lady Wave celebrated Senior Night with a 49-38 win over the Bees. Greenville senor Lani Shilt looks to drive the baseline during first half action of a non-league game against Bethel on Monday. The Lady Wave celebrated Senior Night with a 49-38 win over the Bees. Greenville’s four seniors - Koryann Elliott, Lani Shilt, Jada Garland and Saki Nakamura - are surrounded by their teammates after the Senior Night pregame ceremony. The Lady Wave defeated Bethel, 49-38. GREENVILLE – There is something special about winning on Senior Night. That’s what Greenville girls basketball coach Rachel Kerns said after her squad did just that by defeating Bethel 49-38 on Monday night in the GHS gym. 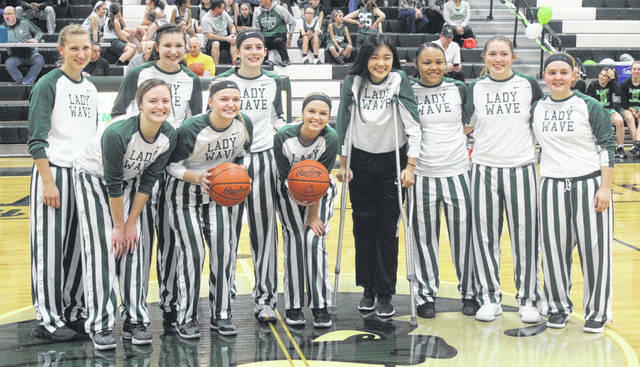 Seven players found the scoreboard for the Lady Wave including three of the four seniors who were honored prior to tip off. Jada Garland had 9 points followed by Lani Shilt and Koryann Elliott with 4 points apiece. The fourth senior – Saki Nakamura – is out for the remainder of the season with an injury. Greenville led the entire game except for an early 3-2 advantage for the Bess in the first quarter. 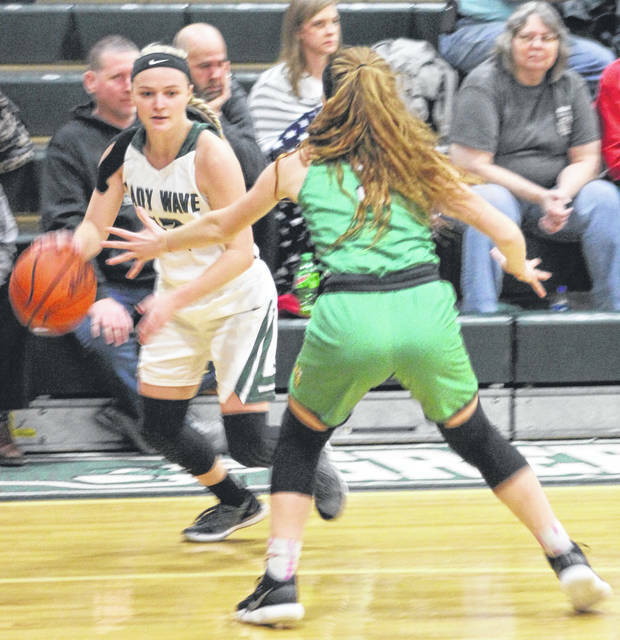 They also tied the game at 19-19 with 3;46 left in the first half, but the Lady Wave went on an 11-2 run the remainder of the second quarter to take a 30-21 halftime lead. Garland hit one of her three 3-pointers during that run. 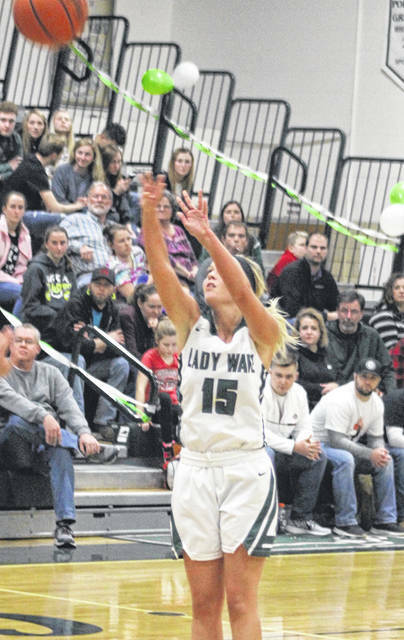 Morgan Gilbert also had a pair of buckets and Haleigh Mayo-Behnken and Natea Davidson each added a score as well. 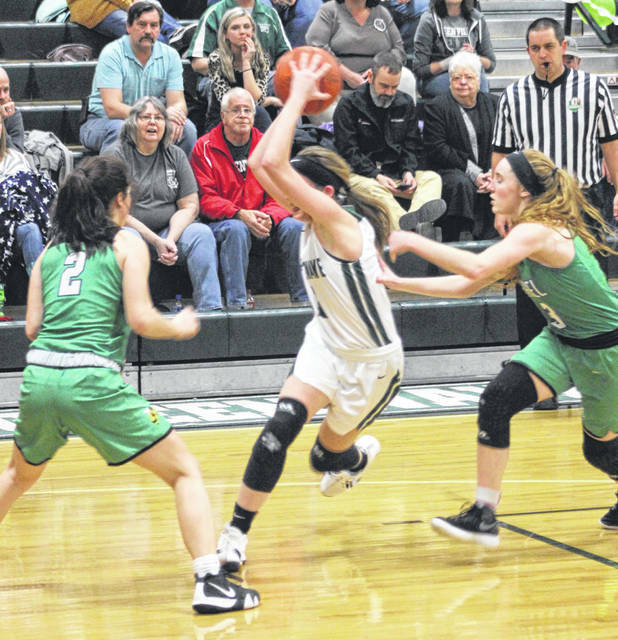 It was more of the same in the third quarter with Mayo-Behnken sinking a pair of free throws to open the second half scoring and a few seconds later Shilt got a steak and drive to the other end of the court for the easy lay-in extending Greenville’s lead to 13 points at 34-21. 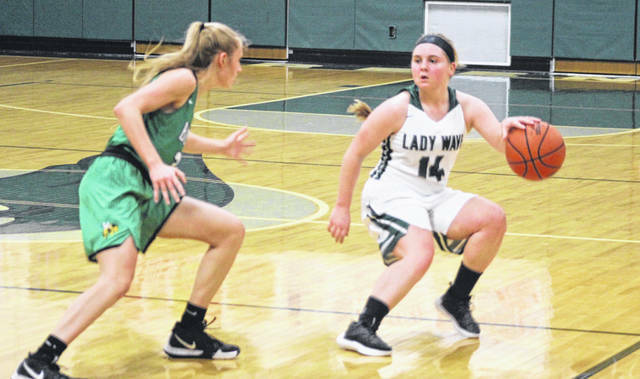 The Lady Wave maintained a lead of 10-12 points for the rest of the third period until Klaudia Lowery cut a 12-point lead to 9 with an old-fashioned 3-point play. She got the layup and drew the foul with 18 seconds to go in the third frame. She sank the free throw to make it 40-31 in favor of Greenville. 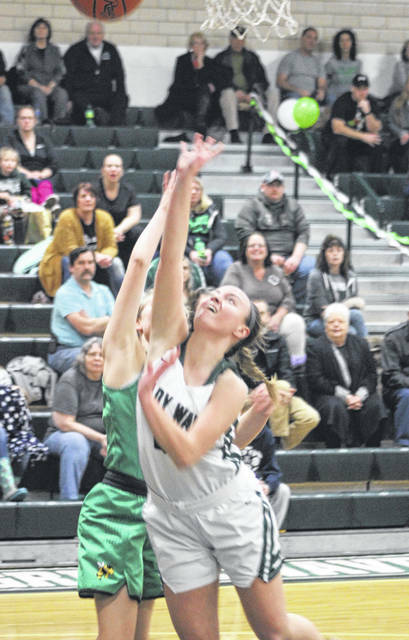 Gilbert then sank the second of two free throws to go back up by 10 (41-31), but Olivia Reittinger was fouled shooting a 3-pointer with 1 second left and she sank two of the three to end the third quarter down by 8, 41-33. Bethel quickly cut that lead to 6 points (41-35) when Lydia Lowery hit a deuce, but the Lady Wave outscored the Bees 8-3 the rest of the way for the victory. Mayo-Behnken was Greenville’s leading scorer with 13 points and Davidson added 10 for her second-highest offensive output this season. She had 12 against Sidney back in December. “Natea is hungry,” Kerns said of the 5-foot-8 junior forward. “She wants to be on the court and she is getting better every game. It was fun to see it tonight and really in that second half I can’t let Nyesha (Wright) go unnoticed. She was amazing rebounding the basketball on both ends. With Jada out there they have to guard her so it opens up a lane and Koryann goes and gets four really quick points at the free throw line and Lani knocked down a couple too. “It was just a great effort by all. It is always nice when all your seniors score on Senior Night, but it was really just a great team win,” she added. 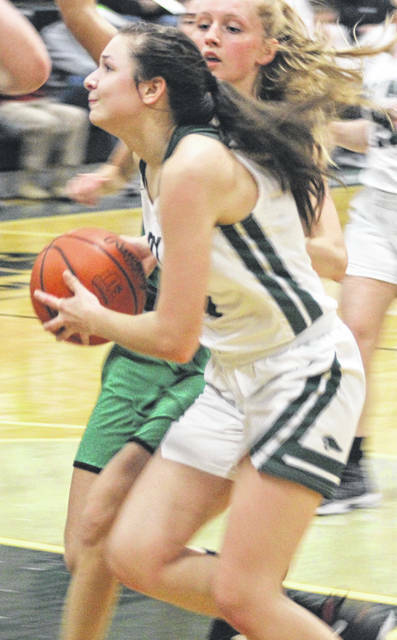 Greenville has two more regular season games to go at Piqua on Thursday and at Sidney on Saturday before beginning play in the Division II sectional tournament. The Lady Wave earned the No. 5 seed in the Tecumseh sectional and will face seventh-seeded Bellefontaine at 3:30 p.m. on Saturday, Feb. 16 at Tecumseh. Bethel – Olivia Reittinger 3 4 12, Natalie Moorman 1 0 3, Klaudia Lowery 3 1 8, Kenna Gray 2 0 5, Lydia Lowery 1 2 4, Makenna Floyd 1 4 6. Totals: 11 11 38. Greenville – Haleigh Mayo-Behnken 3 7 13, Nyesha Wright 1 0 2, Natea Davidson 3 4 10, Lani Shilt 1 2 4, Morgan Gilbert 2 3 7, Jada Garland 3 0 9, Koryann Elliott 0 4 4. Totals: 13 20 49. 3-pointers – Bethel 5 (Reittinger 2, Moorman, K. Lowery, Gray), Greenville 3 (Garland 3). Records: Bethel (10-10), Greenville (9-10). Greenville’s four seniors – Koryann Elliott, Lani Shilt, Jada Garland and Saki Nakamura – are surrounded by their teammates after the Senior Night pregame ceremony. The Lady Wave defeated Bethel, 49-38.